The author and photographer have collaborated to reveal the artworks and architectural secrets that lie behind the doors of some well-known and lesser known, landmark buildings in and around the ‘Mother City’. These buildings are part of the country’s collective heritage, reflecting the myriad cultural influences that have shaped South Africa. 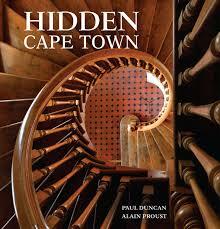 These ‘hidden’ interiors include the Sendinggestig Museum, South African National Library, City Hall, Palm Tree Mosque, Welgelegen, the Royal Observatory, Bertram House, the Greek Orthodox Cathedral of St George, Groote Schuur, the Old Synagogue, Irma Stern Museum and the officer’s mess of the Cape Town Rifles (‘The Dukes’). Superb photography coupled with interesting and informative text, this is essential for anyone interested in South African architecture, design or cultural history.